A few days before my blog's 1st birthday (9 July), I must admit that this little one is pretty much ruling my ways of cooking. Here is today's story: I had two almost rotten bananas and a very ripe mango in the kitchen that were begging me to use up in some cake or bread. When I decided to make a fruity bread with buttermilk, I decided it would be better with just the banana, so I could call it Buttermilk Banana Bread. Three Bs. Easy to remember. No space for mangoes starting with M.
Am I losing my marbles? Or is this a normal development after one year of blogging about food recipes? Please, veteran food bloggers: I need some reassurance on this. 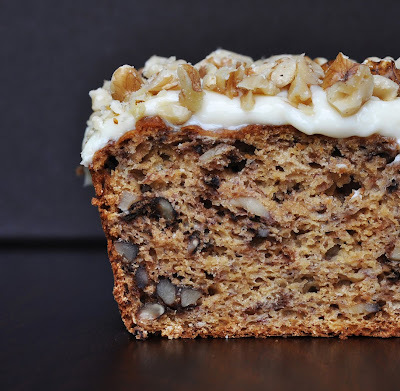 I actually find it hard to call it a bread since its texture is cake-like, although there is no butter and only a tiny amount of oil being used in the recipe.Very moist and spongy, lots of walnut crunch and a slightly indulgent frosting make this banana bread a perfect coffee cake. Preheat oven to 160C. Grease or line loaf tin with parchment paper. In a medium sized bowl, beat the egg. Add agave, buttermilk, vanilla extract and canola oil and mix well. Stir in mashed bananas. In a big bowl, combine flour, baking powder, baking soda and salt. Mix well. Combine wet ingredients and dry ingredients and stir until just combined. Stir in walnuts. Pour batter into prepared loaf tin. Bake for about 60 minutes, until cake tester comes out clean. Take out of the tin and let cool completely. When cool, combine cream cheese and agave syrup in a small bowl. Put an even layer on top of the banana bread. Sprinkle with chopped walnuts.